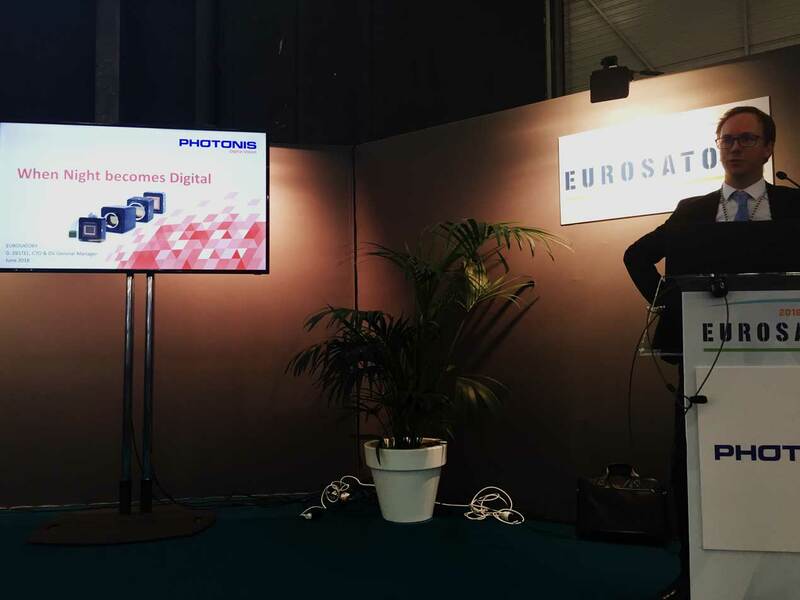 With the theme, “When Night Becomes Digital,” French company Photonis unveiled the latest developments in camera technology at Eurosatory 2018 in Paris. In a climate of uncertainty and insecurity, Photonis says the world demands solutions that ensure situational awareness in all conditions, and at any time of day. Photonis Chief Technology Officer, Geoffroy Deltel, set out the key selling points of the company’s products, which include SWaP, a single solution for day/night imaging. He said Photonis’ easy to integrate solutions were based on video standards and ruggedised cores, which were adapted for the most demanding environments, best sensitivity and image quality using proprietary sensors. Outlining how Photonis sensors are used operationally, Deltel showed a video of a demonstration with French Special Forces, providing clear vision in all conditions, ranging from day to night and extreme conditions (almost total darkness). In addition to seeing at long distances covertly, whilst recording and transmitting, Deltel said its sensors provide “behind-the-eye” information, based on the practice of combining colour and night vision into a single feed. Another key area for Photonis is supplying rifle sights for use in all conditions. Other key features include identifying and reporting threats, in addition to digital zooming and boresight. The next key application Deltel overviewed, vehicle driving in all conditions, gives an extra insight into Photonis’ innovative technology. This enables fast and safe driving (seeing road signs and the tracks of vehicles) whilst providing the vehicle with all round camera coverage. Photonis is also entering the expanding Unmanned Aerial Vehicle (UAV) sector by developing miniature sensors for quadcopter UAVs. According to Deltel, these sensors will have a wide variety of applications in key sectors such as the civilian maritime industry. He said that this compact solution can be further decreased in size and is optimised for digital zooming for detecting stealth lasers. DPI got the opportunity to look through a demonstrator thermal sight that provided a seamless night-vision picture, with the thermal signatures of people in the crowd fused onto the image. According to Photonis, this is a key selling point as they take their cameras (Full HD/ 2048x2048 pixels, up to 180 fpm) into new markets around the world at a time when international militaries, civil defence organisations and the private sector demand smaller, yet more capable and affordable vision solutions. Headquartered in Bordeaux, with offices in the Netherlands and the United States, Photonis specialise in providing cutting-edge optical camera technology for both the civilian and military markets. With 1,000 employees and 80-years experience, the company spends 6% of itsannual revenues on R&D and has filed more than 100 patents.